E. coli Lawsuit Help – The Weinberg Law Firm is currently assisting victims of food poisoning outbreaks nationwide. We are ready to help you too. If you were sickened in the recent E. coli outbreak linked to Costco chicken salad and would like to learn more about your legal rights, please call our law firm at 1-877-934-6274 for a free legal case evaluation. Costco Chicken Salad E. coli Outbreak Update – On November 24, 2015, the U.S. Centers for Disease Control and Prevention (CDC) announced that a total of 19 confirmed outbreak cases of Shiga toxin-producing E. coli O157:H7, or STEC O157:H7 have been reported from 7 states. The number of ill people reported from each state is as follows: California (1), Colorado (4), Missouri (1), Montana (6), Utah (5), Virginia (1), and Washington (1). According to the CDC, these numbers may not reflect illnesses that occurred after November 10, 2015, since it may take from 2 to 3 weeks from the time an individual becomes ill to when the illness is reported. One DNA fingerprint (E. coli outbreak strain) has been identified. Available illness onset dates range from October 6, 2015 to November 3, 2015. Ill people range from 5 years to 84 years of age. Five (29%) people reported being hospitalized as a result of their illness. Two people developed hemolytic uremic syndrome (HUS), a type of kidney failure. Symptoms of Shiga toxin-producing E. coli (STEC) infection may include severe abdominal cramps, diarrhea, and vomiting. The diarrhea may become bloody and can lead to dehydration. There is usually little or no fever. The infection (and its symptoms) will vary from individual to individual, ranging from a mild to a life-threatening illness. Product Information – The product linked to the outbreak is labeled “Chicken Salad made with Rotisserie Chicken” and bears the item number 37719 on its label. 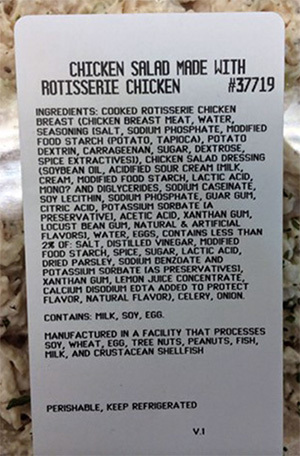 What To Do If You Purchased Costco Rotisserie Chicken Salad – The CDC advises that “Consumers who purchased rotisserie chicken salad from any Costco store in the U.S. on or before November 20, 2015, should not eat it and should throw it away.” They also caution that even if some of the chicken salad has been eaten and no one has gotten sick, the rest of the chicken salad should be thrown away. What To Do If You Think You Were Sickened – If you think that you or a loved one may have become ill from eating Costco rotisserie chicken salad, the CDC advises that you should contact your health care provider. According to the CDC, most people infected with Shiga toxin-producing E. coli (STEC) develop diarrhea (often bloody) and abdominal cramps an average of 3-4 days after swallowing the germ. Although the available epidemiologic evidence at this time suggests that rotisserie chicken salad made and sold in Costco stores is a likely source of the outbreak, public health investigators have not yet identified the specific ingredient in the chicken salad that has caused the illnesses. Costco notified public health officials on November 20, 2015, that the company had removed all remaining rotisserie chicken salad from all stores in the U.S. and stopped further production of the product until further notice. If you or a family member has suffered from E. coli food poisoning, and you have a question about your legal rights, you can request a free legal case evaluation from our firm by calling toll free at 1-877-934-6274. Our phones are answered 24/7. To learn more about E. coli and E. coli lawsuits, please visit our additional website www.ecolilawsuit.com .